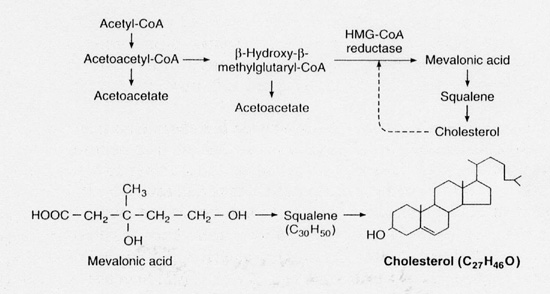 Statins work by inhibiting the conversion of HMG-CoA to mevalonic acid- stopping cholesterol synthesis- this step being crucial to the body in creating cholesterol (Fig. 1). Fig.1. Pathway of cholesterol synthesis. The substance which inhibits HMG-CoA reductase was isolated from the mould Penicillium citrinum. 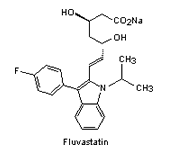 This inhibitory compound ML-236B is known as Mevastatin (Fig. 2). Fig. 2. The structure of some of the statins. 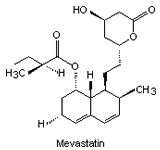 By 1979 more statins had been developed from similar compounds and Mevastatin itself. 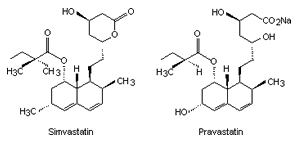 Several derivatives were developed (their structures and names shown in Fig. 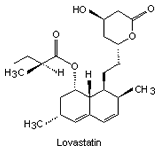 2) but did not reach consumer markets until 1987 (in the case of Lovastatin). Such lengthy development timescales coupled with the ferocious competition and vast cost of research into such drugs requires drug companies to secure their drug for profitable sale in order to cover their costs. Companies can do this by patenting their drug’s structure or manufacture. Must make idea public in order to patent it (an attempt to increase the total amount of knowledge available to the public). Must be a novel idea and practical. Must apply for a patent in every country. Cannot patent idea if the idea/product has already been disclosed (non-disclosure agreements between individuals essential- can be a problem within the scientific community where communication is essential). Patenting the product gives the company/individual sole rights to its manufacture and design for a period of 20 years. Securing the intellectual property rights of a new drug, although seeming like ‘money grabbing’ to some is essential for the survival and furtherance of new drug research and development. Drug development is a painstakingly long and costly process with vast amounts of money spent on clinical trials and drug development as illustrated in Fig. 3. Fig. 3. 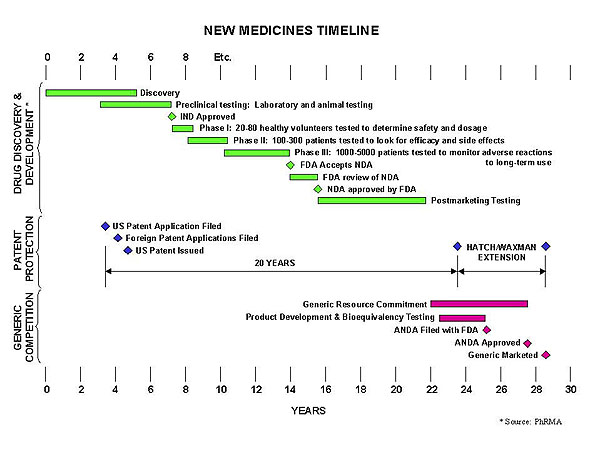 Drug development process and timeline. The process of patenting has largely served society well over centuries. This balancing of rewards and contribution has been crucial to attracting private investment into pharmaceutical research. Private investment in the discovery and development of effective drugs has been underpinned by the patent process, and would diminish sharply, if not totally, without a strong patenting process. Drug discovery and development is very costly; the most recently cited figure is about two hundred and thirty million pounds sterling for each new drug developed. It usually takes between eight and twelve years from starting research to first marketing, and is highly risky. Without a fully functional patent system to protect companies who do achieve success in this risky business, there would have been little past investment in drug research, and many modern therapies would not have been developed. Clearly, while many illnesses and diseases remain inadequately treated, it must be beneficial to encourage investment in the discovery and development of improved drugs. The availability of the patent system to protect successful inventions is essential. The drug industry seems to be dominated by a few very large players. This is well illustrated by the development of the statins. Pravastatin, which is marketed under the trade name Pravachol, is owned by the second largest Japanese pharmaceutical company, Sankyo Co. Ltd. Many of the large pharmaceutical companies seem to work together, as is illustrated by the US and European licencing agreement between Bristol-Myers Squibb and Sankyo for Pravachol. Interesting degrees of 'collusion' can also be seen between Sankyo and Parke Davis (a subsidiary of Warner Lambert) in setting up a joint venture for the marketing of Colesevelam – a new cholesterol lowering drug, in direct competition with Lipitor and Pravachol. Such co-ordination and partnership is important in a time when the future patenting of new drugs is coming into question by the American government. Legislation passed by the U.S. Senate has weakened patent protection for brand-name drugs by allowing generic drugs to reach the market sooner. Supporters claim that the bill (S. 812) would reduce drug spending by $60 billion over the following 10 years. Despite the reduction in drug costs for individuals and health services, weaker drug patents would reduce incentives to develop the next generation of drugs. Innovative drugs can do far more to hold down exploding costs and improve our quality of life. Table 1 shows the expiration dates for the patents of various statins on the market today. The expiration of such patents would see the introduction of vastly cheaper ‘generic’ drugs onto the market. The future of patenting natural products has been brought into disrepute by the human genome product and the possible patenting of genetic sequences for financial gain. So what would be the consequences of successful patent applications of gene sequences? Knowledge of human gene sequences can be used in a very wide range of methods to discover new drugs. However, when a single company, however large and well resourced with both money and research talent, hold the patent rights to a large number of genes, only a limited range of uses of the information will be practical. The scale of available resources cannot, in these circumstances, match the full range of research opportunities. Ideally, fundamental information such as gene sequence and mapping data should be free for use by all, but we must remember that much of this information would not be available without investment which expects to profit from that investment. The debate continues to occupy the minds of the scientific community.